Has 9 recipes, 1 public recipes. Has 54 flavors in inventory. I was looking to make an ADV that was juicy and sweet, but backboned by floral aroma instead of the all-out sugary blast I usually find with watermelon recipes. I wanted to smell this as much as taste it. 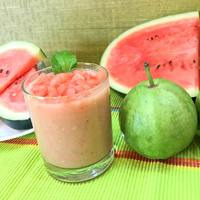 FA Watermelon: I chose this watermelon because I find it provides a sweet but slightly more subtle flavor. It’s a dryer watermelon that blends well without overpowering the mix. INW Cactus: Pairs perfectly with FA Watermelon. At 1.75% it adds a lot of juiciness and got me started on the floral scent I was looking for. FA Pear: I find this flavor works similarly to INW Cactus. It adds some juiciness, a great earthy-tasting sweetness on the backend, and really boosts the aroma. CAP Sweet Guava: Again, this one adds some wetness to the dry watermelon and a sweet yet flowery inhale. I’ve had this flavor since day one, but was honestly never a big fan. I had serious doubts along the way if I could get this to work. Most recipes have Sweet Guava at 4% or higher, but I found it to be way too sweet. It balances very well at 1.5%. FA Meringue: My go-to fruit sweetener, plain and simple. Despite the added sweetness from the FA Pear and the Guava, I couldn’t get the sweetness I wanted from those two without boosting the % and screwing up the flavor balance. A touch of Meringue took care of that. Koolada: Stop me if you’ve heard this before – the Koolada is totally optional, based on personal preference. I like to add just 1-2 drops per 10mL, which gives this mix the airy, cold taste you’d expect from a margarita. It's basically perfect, one of my all-time favorites. Awesomely layered - it's one of the few recipes where you can taste every flavor distinctly. One of the best DIY recipes ever. The fact that it's so easy and cheap to mix is just a nice bonus. This has been my ADV for a year. Cheap, easy, and delicious. You can swap in practically any fruit and get an equally good mix. TFA Apricot and CAP Honeydew are both awesome.